Caleb got himself a brand new Little Tikes Cozy Coupe Car for his first birthday a couple of weeks ago and he LOVES it! My oldest son Jeremy also got a Little Tikes Cozy Coupe car when he was a toddler and rode that thing everywhere. He loved his too. I knew when Caleb’s birthday started approaching that the Cozy Coupe Red Car would be Caleb’s big gift from his dad and I. This was a great choice for a first birthday gift. In a Hurry? 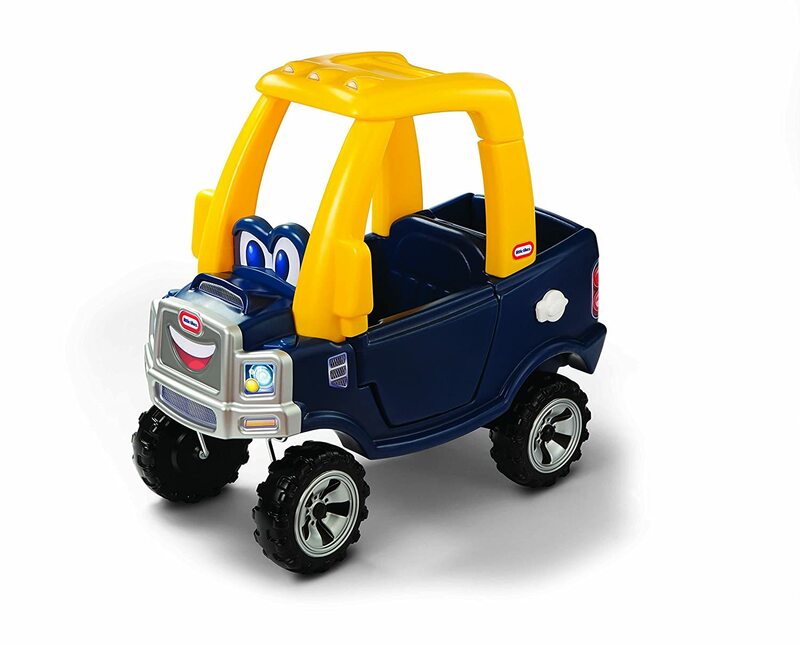 Buy the Little Tikes Cozy Car HERE! Little Tikes Red Push Car Makes a Great Gift! Toddlers all go crazy over the Little Tikes Cozy Coupe. In fact, chances are if you visited every local daycare center in your area, you will see a bunch of Little Tikes Cozy Coupe cars in the play area. And there is a good reason why, KIDS LOVE the Cozy Coupe Cars. They’re so much fun to play with and let toddlers imitate adults by driving around all over the place. The Little Tikes Cozy Coupe Car Is So Much Fun! Our Little Tikes car is so much fun. It provides hours of entertainment both inside and outside our home. What is a Good Age For The Little Tikes Cozy Coupe? The recommended age for the Little Tikes Cozy Coupe is 18 months and up. However, I bought my kids all their first Cozy Coupe car when they turned 12 months. At this age they aren’t quite old enough to push it with their feet by themselves but that doesn’t stop toddlers having fun in it. Caleb LOVES his Little Tikes Cozy Coupe Car! Check out the Little Tikes Cozy Coupe Car Features! There have been a lot of improvements to the Little Tikes Cozy Coupe Car over the past few years. These changes make it easier for little ones to grow into this adorable red push car. One of the new features is the removable floor which prevents your baby from sliding out. I didn’t realize that this had been added until we took the car out of the box. I love this new feature. Also added to the Cozy Coupe car is the lock on the door. This helps prevent younger children from falling out which is especially helpful if you are pushing them in the car. Another great feature is the handle on the top of the Little Tikes ride car. This handle helps parents push the car around. Little Tikes Cozy Coupe Has a Place to Hold Your Drinks! The Little Tikes Cozy Coupe Car also has a built in cup holder which holds 2 different drinks! That’s perfect for mom and toddler. Is The Little Tikes Cozy Coupe Hard To Push? I know a lot of parents are curious to know if they Little Tikes Cozy coupe is hard to push. The short answer is no. With the new handle that is on the yellow roof it’s easy to grip the car and push it all around. It’s easy to push in the grass or on the pavement. Does The Cozy Coupe Steering Wheel Turn? Yes the steering wheel does turn and it’s one of Caleb’s favorite parts. However, the steering wheel is not connected to the wheels so it can’t turn the car. The only person who can do that is the person pushing it or the toddler using their feet. Toddlers love to open things and close them. That’s exactly what the Cozy coupe gas cap does! 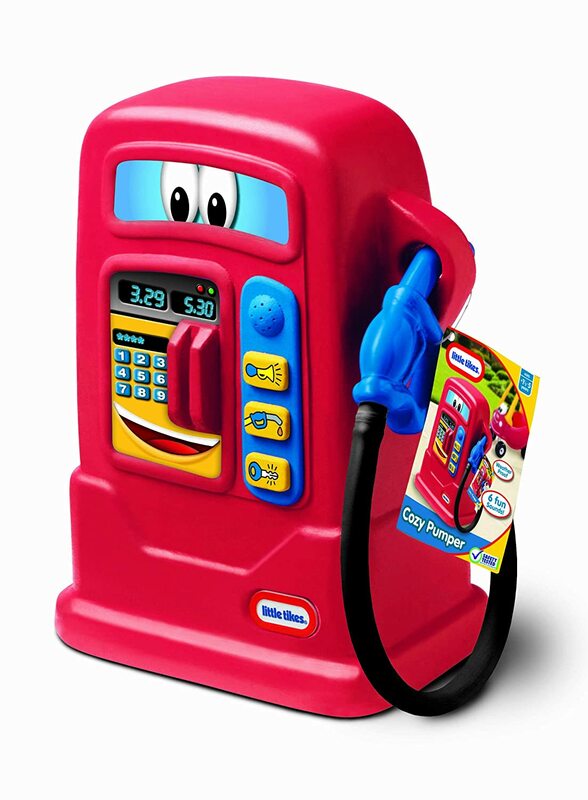 Toddlers can easily open the gas cap and then close it when they want too. The Little Tikes Cozy Coupe Car has a lock on the door which helps to secure the door and prevent your little one from falling out. This makes me feel a little more at ease when the big kids are pushing Caleb around. I know that he can’t easily open the door and fall out. Of course I think as he gets older he will probably figure out how to unlatch it, but hopefully then he will know not to fall out! Putting the Little Tikes Cozy Coupe Together was EASY! When you first take all the parts of the Little tikes riding car out of the box it can be a little intimidating. There are a lot of pieces! But putting this fun toddler car together was a snap. It took my husband about 20 minutes from the time he took the cozy car out of the box until it was fully assembled. The only trouble we had was when he put one of the white lights on the front and accidentally cracked it. So be careful how hard you screw the pieces in! Caleb Loves his red Cozy Coupe! In fact I think he would agree with me that this is a great gift for a 1 year old boy. We made this funny video below for the kids youtube channel Fun and Crazy Kids. It shows the Little Tikes cozy coupe car in action. Buy The Little Tikes Cozy Coupe Car Online! It’s CHEAPER! 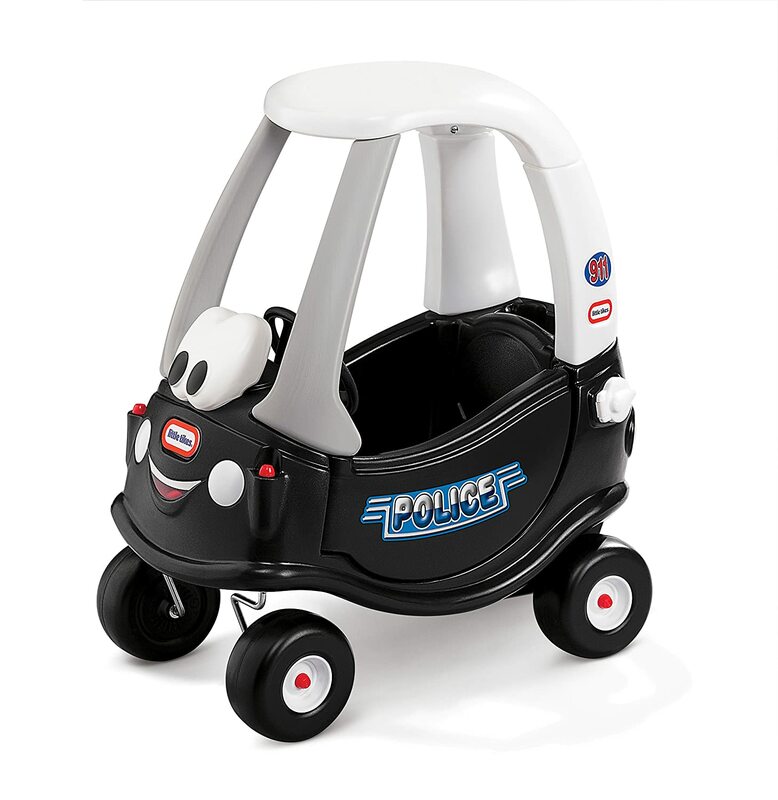 When I started shopping for our son’s new Cozy Coupe Car from Little Tikes I looked both in stores and online. I found that the best deal for the Little Tikes car was on Amazon. 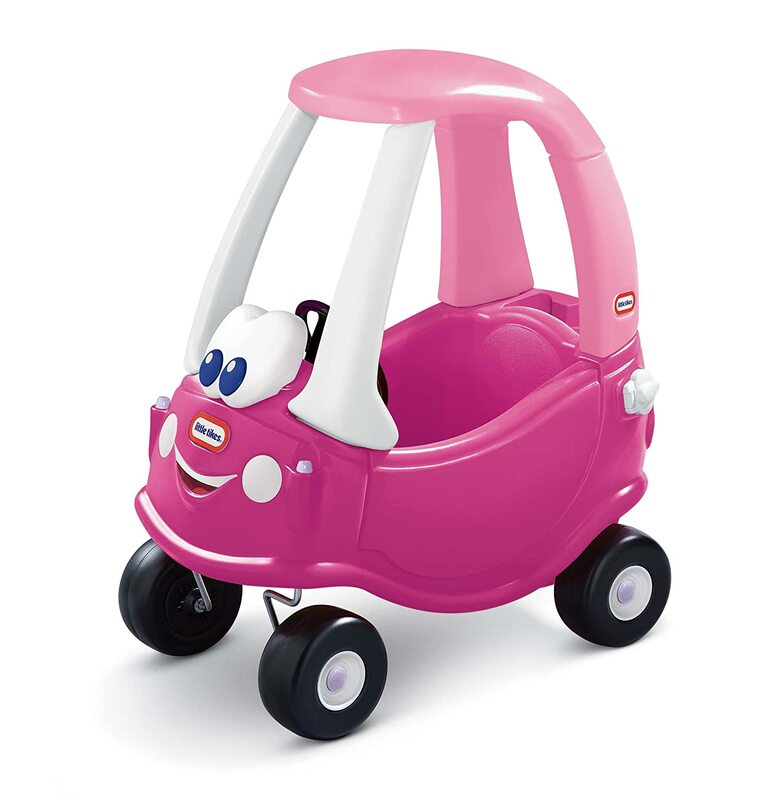 You can actually find the Cozy Coupe Car cheaper on Amazon than in most retail stores. This was the place that I found had the lowest price on the Little Tikes Cozy Coupe. Plus they deliver it right to your door for free and you can’t really beat that kind of convenience.